Because of its high accuracy and low drift, the rate-integrating gyro is the type most often used in spacecraft attitude sensing. The gimbal is mounted so that its motion is essentially frictionless and without spring restraint. It is usually a sealed cylinder which is immersed or floated in a fluid. The spin axis in the cylinder is generally supported by either gas or ball bearings. Because the viscous damping and spring constants are both small, the steady-state solution to Eq. (6-15) indicates that an RIG's output (i.e., the rotation of the gimbal about the gyro's output axis) is proportional to the spacecraft's angular displacement about its input axis. In practical applications, gimbal motion is usually limited to a few degrees. Two different procedures are frequently used to measure larger angles and to improve accuracy when measuring smaller angles. In the first method, the gyro is mounted on a platform which is rotated in a closed-loop system using the gimbal motion signal to maintain the gimbal position near the zero point. The gyro's output is then proportional to the rotation of the platform which, in turn, is proportional to the rotation of the spacecraft about the input axis. 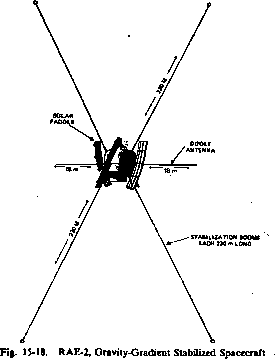 Alternatively, the gyro can be fixed in the spacecraft with the gimbal torqued magnetically using a closed-loop system to maintain its deflection near null. As is done for similar RGs, the gyro's output is derived from the torque current, which is proportional to the spacecraft rotation. Such a gyro is referred to as a strapdown torque rebalanced RIG. The torque current may be either analog or pulsed. Pulsed torquing has gained in popularity because of its utility in computer applications. The torque current from either type of torque rebalanced gyro may be differenced after small time intervals before being output, so that the resultant gyro output during any one of these small time intervals is proportional to the differential spacecraft rotation and, thus, to the average spacecraft velocity during the interval. An RIG operating in this way is referred to as a rate-integrating gyro in the rate mode. The principal source of error in an RIG is drift rate instability. The systematic errors of drift, input axis misalignment, and scale factor error can be modeled and corrected for as described in Section 7.7. In torque rebalanced RIGs with floated gimbals, the component of drift instability caused by thermal effects is minimized by automatically controlled heaters. Most of the residual drift instability normally results from random null shifts in the torque rebalance control loop. A short-term component of this instability, referred to as random drift, can be related to float torque noise (i.e., noise in the torque applied to the floated gimbal). Similarly, a random walk component, referred to as drift rate ramp, can be related to float torque derivative noise. The effects of both of these noise sources on the uncertainty in gyro outputs can be modeled so that spacecraft attitude error can be predicted (Section 7.7). Occasionally, however, fluctuations in the spacecraft voltage or changes in the magnetic environment cause systematic null shifts, which are difficult or impossible to model. In many cases, use of a regulated gyro power supply reduces the voltage fluctuation effects, although the cost of the gyro package is considerably increased. Additional information concerning RIGs is given by Schimdtbauer, et al., ; Greensite ; Thomson ; and Scott and Carroll , Table 6-9 lists the characteristics of typical RIGs manufactured by Bendix and Honeywell.